A heartbroken girlfriend hanged herself just two months after after her boyfriend took his own life, an inquest heard today. Hotel receptionist Laura Bedernyak, 30, killed herself after the death of her football player boyfriend, Kyle Jones. 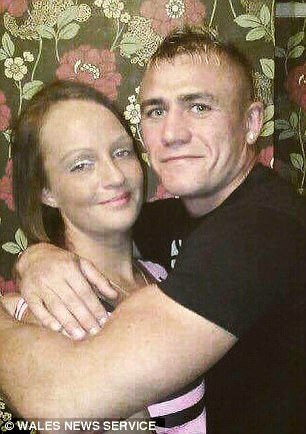 The 'sociable' mother-of-one fell into deep depression after talented amateur player Kyle, 29, died in January after a New Year's Eve party. An inquest heard the Travelodge receptionist sought help for insomnia, sickness, and depression linked to her grief. Best friend Jody Kennett told the inquest in Aberdare, South Wales, Laura was 'fun-loving' until her boyfriend's death. Ms Bedernyak, of Brackla, Bridgend, South Wales, told friends and medical professionals she had never considered taking her own life. She became withdrawn and stopped going out with friends, but was convinced to join her friends on a night out in March. But the next morning she failed to ring friend Miss Kennett as had become the norm, leading to her friend entering her unlocked home and finding Laura unresponsive. She also left three suicide notes on her living room coffee table. Coroner Andrew Barkley said Ms Bedernyak had been considered a 'medium to low' risk of suicide by mental health practitioners after being assessed. Mr Barkley said: 'Her father says two days before her death she appeared happy, while other evidence says she was up and down. 'When she was assessed there was no evidence she was showing suicidal intent. Mr Barkley recorded a verdict of suicide.